Patricia Heyward is the alias used by a Founder who was among one of the one hundred baby Founders sent out. By 2345 the Founder was on Earth and adopted by an Earth family that could not have kids and was given the name Patricia Heyward. Her adoptive father was a scientist who worked with the infant shapeshifter. Realizing how xenophobic Earth was Patricia and her adoptive parents kept her true identity secret mostly out of fear. She spent her childhood working towards entering Starfleet to explore space in hopes of finding her people. 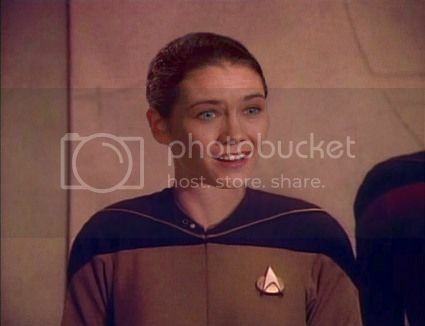 She entered Starfleet Academy in 2367 majoring in engineering. After graduating from the Academy she was assigned to the UESS Enterprise (which was later rechristened the USS Enterprise when the United Alliance of Planets was formed). She was stuck on the Prometheus when it was forced to slide. While on Prometheus she learned about her people and learned that in the Prometheus' home quantum reality her people ran an organization called the Dominion. She continued to pretend to be human and when she arrived in the Prometheus' home quantum reality she requested an assignment away from the potential front lines of the war. Since the Yorktown was not on the front lines the engineering staff of the Yorktown did not have to undergo the tight screenings the higher profile ships did. She wanted to go to Deep Space Nine to meet Odo but was afraid that if she went to the station she would somehow get caught. Even after the war was over she was still scared to let anyone know her true identity so she continued to serve on the Yorktown without distinction not wanting to bring to much attention to herself.